"Fortyville" (south of Mayview), Lafayette County, Missouri; sometime before 1914. From Fiegenbaum-Gerber family; all rights reserved. With the cursor on the image, use the "Maximize" icon if visible in the lower-right corner to view full size. 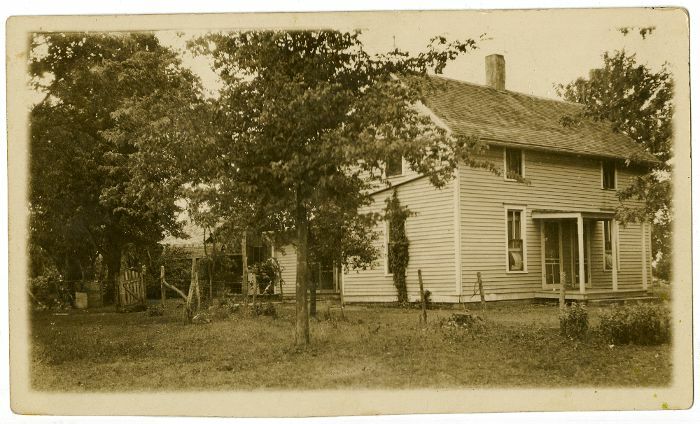 This was the farm house prior to 1914. The two front doors, the two side-by-side panes in each window sash, the gable roof and the single chimney, the downspout high across the side of the house, and a front porch that does not cover the front windows are distinctive features that distinguish this earlier structure. Some of these features are even more apparent in a photograph from about 1898. The downspout, the gate and the braced tree in the side yard are prominent in one of the full-sized photos of Wilhelmine Louise (Fiegenbaum) Starkebaum and help to pinpoint the place and time. It would appear that the downspouts directed rain water from the roof to a cistern located at the rear corner of the extension built on the back of the house (view the full-sized versions of both images). Edwin Friederich Fiegenbaum, who grew up sleeping in a bedroom on the upper floor of this house, was aware of another significant feature. The house was not insulated and it was not unusual for him to awake on a winter morning to find a good frost inside his bedroom. Uncle Ed's nephew, J. W. Fiegenbaum, would tell of the same experience in his bedroom on the upper floor of the Fiegenbaum home on Douthit Road, just a few miles east and a couple of decades later. Lafayette County, Missouri; after 1914. From Fiegenbaum-Gerber family; all rights reserved. This was the farm house built in 1914, replacing the earlier dwelling. It is distinguished from its predecessor by the single front door, the much wider front porch that extended over the two front windows, the double chimneys, and the hip roof. The upper and lower sashes of the first and second floor windows each have a single, large pane. And there is no downspout on the side wall of the house. The basement window visible on the side of the house and the height above the ground of the front porch when compared with the earlier house would suggest that the foundation of this later structure was higher above grade than that of the first house. Perhaps the window is indicative of a full- or nearly full-height basement. These are photos of two homes that have stood on one of the Missouri farms that has been associated with many generations of the Fiegenbaum family. To call it the "Fiegenbaum – Starkebaum Farm" is to assign it an arbitrary label from only one time in its long history. But each story must begin somewhere and once upon a time. The farm is located south of the town of Mayview in the southeast corner of Washington Township in Lafayette County, Missouri. In times past, the house and farm were situated just north of U.S. Route 40. A small gas station and country store was located across the highway from the home and the locale was known locally as Fortyville. "That happened at Fortyville" is a common description in a good many family stories. U.S. Route 40 still exists, but in this area it runs south of and parallel to Interstate 70, serving more as an access road than the cross-country federal highway it was at the beginning of its life. The unpaved road that fronts the property, now known as Fortyville Road, intersects I-70 at interchange 45 (Google Maps). The map on this page shows only a portion (the lower left corner) of a plat map published in 1930 of the survey Township 49 North, Range 26 West in Lafayette County, Missouri. It serves as a visual representation of the geography of one extended family at one brief period of time; it is the somewhere of this story. There is a link below the map to a view of the entire map. 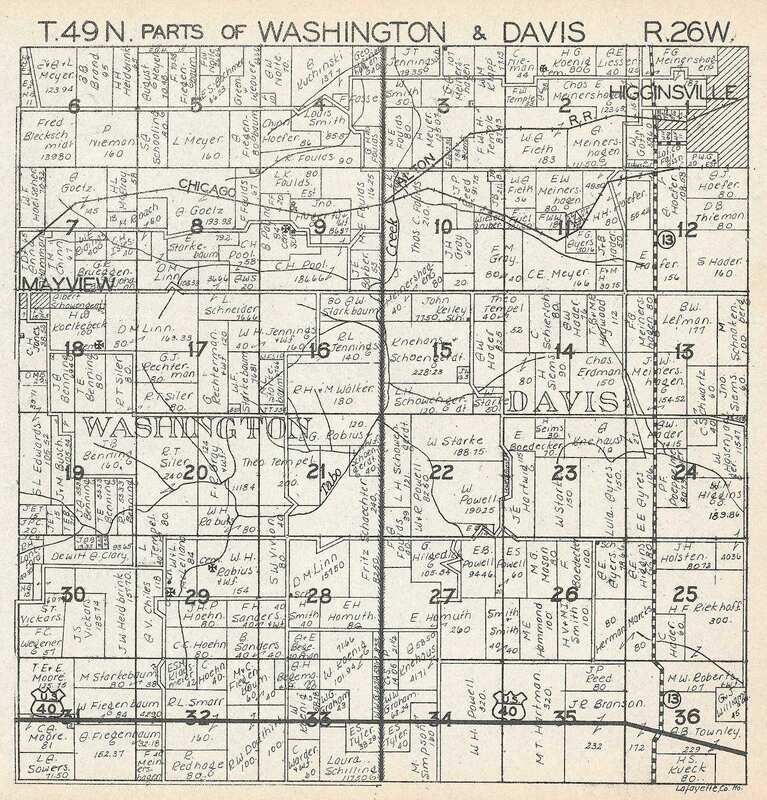 The heavy, "hairy," vertical line running along the right margin of this map is the division between the civil townships of Washington (partially shown on the map) and Davis (not shown, off the right side). U.S. Route 40 can be seen running east-west through sections 31 to 33 at the bottom of the map. The Federal-Aid Highway Act of 1956, which would give birth to the Interstate Highway System, was not yet a fact. Southwest corner of Township 49 North, Range 26 West from Plat Book of Lafayette County, Missouri (Rockford, Illinois: W. W. Hixson & Co., 1930), page 23. Published in 1930, this map shows land ownership for survey Township 49 North, Range 26 West of Lafayette County, Missouri. It includes portions of the civil Townships of Washington (on the left) and Davis (right), and portions of the towns of Higginsville and Mayview. Wilhelm Friedrich & Henrietta Caroline Amelia (Starkebaum) Fiegenbaum were the first of the Fiegenbaum family to occupy the farm, shown in yellow , that is at the center of this story. According to Wilhelm's obituary, he and Henrietta moved to the farm after their marriage on 19 October 1893 at Higginsville, and had spent their entire married life in that home. The farm immediately to the north, marked in orange , was owned by M. Starkebaum. On a 1914 plat map, the owner of the same land was identified as Minnie Starkebaum. Both references are probably to Charlotte Wilhelmine Louise Starkebaum (1870-1948), Henriette C. A. (Starkebaum) Fiegenbaum's sister. "Minna" or Minnie," as she was known, never married. Wilhelm and Henrietta's eldest child, Martin Herman Fiegenbaum, married Clara Louise Drewel on 6 June 1917. Their farm, often identified by the family as the Douthit Road farm, is shown on this map in blue . Martin and Clara lived there until about 1934 when Martin stopped farming and began operating the local Missouri Farmers Association (MFA) oil franchise. He and Clara relocated to a home on Fairground Avenue in the nearby city of Higginsville. Wilhelm and Henrietta's daughter, Emma Florentine Fiegenbaum, married August Henry Begemann on 6 March 1918. Their farm is shown on this map in tan . They raised their ten children in this home. Wilhelm and Henrietta's son, John Henry Fiegenbaum, married Katherine Margarete Maun on 14 May 1924. They began their married life living in Tulsa, Oklahoma (where a son, J. W. Fiegenbaum, was born) and Miami, Oklahoma (where Dorothy Lorraine Fiegenbaum was born). John earned his living in the auto repair business. By about 1928, the family had return to Lafayette County, Missouri, and John resumed farming. 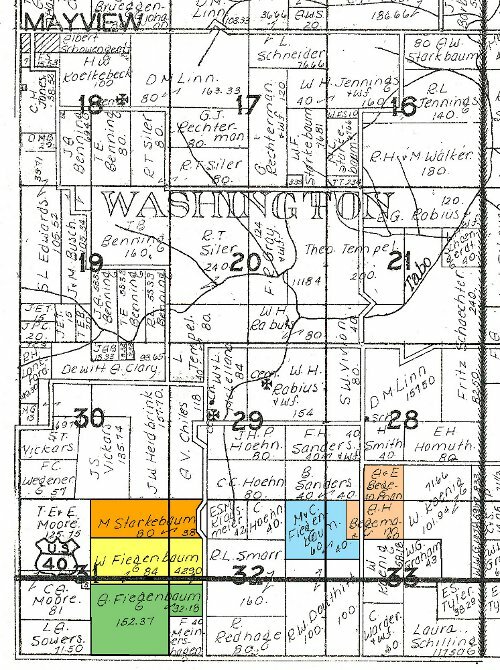 The family lived for a short time on the farm of August Fiegenbaum, marked in green on this map. Henry Martin Fiegenbaum, a second son and third child, was born here on 4 May 1930. J. W. Fiegenbaum referred to the owner of this farm as "Uncle August." August Hermann Karl Fiegenbaum (1875-1947) was actually J's granduncle, a brother to J's grandfather, Wilhelm Friedrich Fiegenbaum. In his tales of his childhood, J. W. was much more likely to identify this farm as the "Brown place." a label that I assume dates from an earlier time. Indeed, according to a 1897 plat map, "Uncle August's" farm was part of a slightly larger parcel owned by one J. T. Brown. On a map published in 1914, the owner was W. B. C. Brown. A map of the same land in 1920 shows that ownership had changed hands and was the same as shown on the 1930 map on this page: the largest portion belonged to A. Fiegenbaum while a smaller piece was assigned to F. Meinershagen. Apparently as the economy worsened during the Great Depression, August Fiegenbaum lost his farm south of U.S. Route 40. John and Katie Fiegenbaum moved their family to the "Fred Sanders farm." Two properties north of M. & C. Fiegenbaum's land on this map is the farm of F. H. Sanders + wf. This is the farm that became home to the John H. and Katie (Maun) Fiegenbaum family after they moved from the "Brown place,". 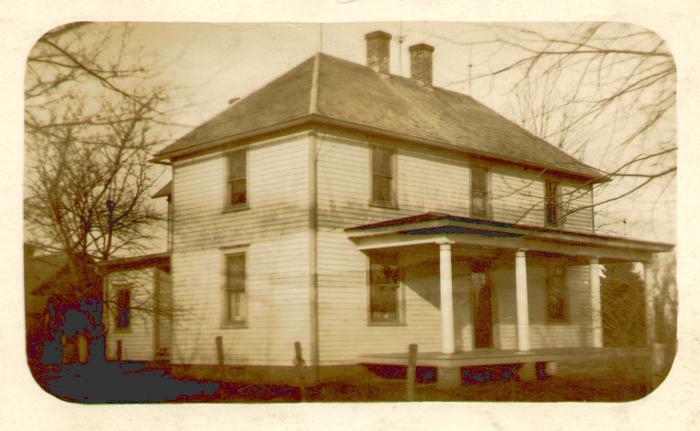 According to J. W. Fiegenbaum, the family lived here from 1931 until about the autumn of 1935, when they moved to the vacant home on the former M. & C. Fiegenbaum land. Late in his life, J. W. Fiegenbaum wrote down a brief remembrance of this part of his life. It must have been in the spring of 1930. We were living on the Brown Place across from the Sowers Gas station (Forty-Ville) where the Purple Swan Bus line made occasional stops. Brother Henry's birth date of May 4, 1930 had not taken place. My mother and I walked down to Tyree School. Hospitality was extended by an upper class student named Elizabeth. In my mind's eye I still see her. She had dark, curly hair. She sat on the top of a desk; she and my mother talked. About what? I'm no longer sure but I think it was about my pending attendance at Tyree School. Then Henry had his birthday and in the fall of 1930 we moved by wagon (high wheel) to the Fred Sander farm (crop rent) which, but for a road, bordered on the lot of D. S. In any case, my schooling began at Douthitt School in the fall of 1931 – graduation in the spring of '39. Elizabeth, I came to know that she was Elizabeth Moore, the daughter of Mr. & Mrs. Clarence Moore. In the course of time I came to know Mr. Moore, a person highly thought of by John (father) & Edwin Fiegenbaum. Now history seems somewhat "fuzzy" but memory tells me that the Moore and Bertz families became related and that Elizabeth was the connected link. Memory is a wonderful faculty and it is pleasant & satisfying to spill what is remembered - correctly, hopefully. Tyree School was located south of the August Fiegenbaum farm , not far off the bottom edge of this map. Douthitt School (D. S. as J. W. also refers to it), was located northeast of Fortyville. Its location on this map is marked by a small black square and the abbreviation sch which runs directly into the large number 28. You can see that the school is directly across the road from the F. H. Sanders + wf. land, just as J. W. recalled. Eventually John and Katie purchased property (Google Maps) south of U.S. Route 40, which on the map on this page is identified as belonging to C. Warder & wife and Laura Schilling. Following their retirement from farming, the land was incorporated into the state-owned Maple Leaf Conservation Area. Wilhelm Friedrich Fiegenbaum died suddenly on 12 November 1929 while doing the ordinary, daily chores on the farm where he had lived since he married in 1893. His son, Edwin, found him in the evening in the wagon from which he had been shoveling corn out to the hogs. According to the death certificate, the cause was not determined. He was buried in the cemetery of Zion Evangelical and Reformed Church, in Mayview, where he had long been a member. At the time of the fifteenth U.S. census, the enumeration of Wilhelm's former home, conducted on 22 April 1930, showed that his youngest son, Edwin Friederich Fiegenbaum, a 26 year old, single farmer, was the head of the household. According to the census, other members of the household were Edwin's mother, Henrietta C. Fiegenbaum, a 57 year old widow and Edwin's aunt, Wilhemine [sic] Starkebaum, age 59 and single (no doubt, his mother's sister, Charlotte Wilhelmine "Minna" Louise Starkebaum, who owned the next farm over). On 31 January 1931, Edwin Friederich Fiegenbaum married Lucille Marie Caroline Rinne. They remained on the "old place," where they raised their two daughters, Carolyn Clara Fiegenbaum and Mary Henrietta Fiegenbaum. During the Cold War, the U.S. government built an underground anti-ballistic missile silo on the farm in 1963, within sight of the house, and since then the place has been known in family lore as the "missile farm". The military facility was dismantled in 1993, but the location is still very visible in online maps if you choose the satellite view of the land. In November 1954, Henriette C. A. (Starkebaum) Fiegenbaum moved from the farm at Fortyville to live with her son, Martin H., and his wife, Clara L., on Fairground Avenue in Higginsville, Missouri. 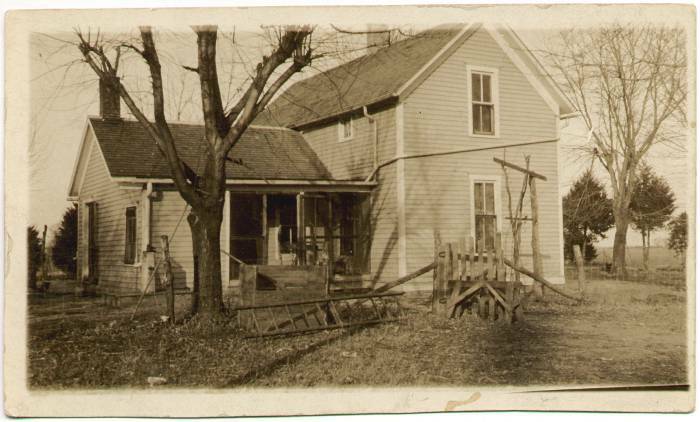 When Edwin F. and Lucille M. C. (Rinne) retired from farming and moved to Blue Springs, Missouri, the farm passed to Henry Martin & Mary Ellen (Schmutz) Fiegenbaum. Henry M. Fiegenbaum was the youngest child of John H. and Katie (Maun) Fiegenbaum and he only farmed the land of the old Fiegenbaum-Starkebaum (or Fiegenbaum-Rinne) farm. He and Mary Ellen lived on the farm on Douthit Road where he had once live for a time as a child, the farm that had once belonged to Martin H. and Clara L. (Drewel) Fiegenbaum. But, that is a whole 'nother story. I'll tell that one next time. Not only did this extended family "live together," so to speak, they worked together as well. The pictures on the following pages will show the same cast of characters engaged in shared labor.